The Oregon Birding Association is pleased to announce the availability of grants of up to $1,000 each for projects that align with our mission to further knowledge, education, enjoyment and science about birds and birding in Oregon. Three grants of up to $1,000 each will be offered in each of two application periods each year. Application deadlines for the two grant cycles are February 1 and August 1 each year. Applications will be reviewed and selections made at the OBA Board meeting that follows each application deadline (typically in March and September). To allow opportunities for a variety of projects, successful applicants with continuing projects may not apply during the next grant cycle but may apply again after that. Please see the application form for submission instructions. Earmarked monies will be set aside in the Fund for worthwhile projects related to the purposes of OBA, to be dedicated at the Board’s discretion. Examples could include special publications, improvements in Oregon Birds, ornithological research projects, etc. Establishment of the Fund was made possible by generous donations from Medford birder Otis Swisher, who is also a past OBA President. All donations are tax-deductible. A handy check box will be added to OBA subscription and ordering forms to make it easy to earmark contributions to the Fund. The Kalmiopsis Audubon Society for support of the Little Birders Club. Read about the Little Birders Nature Camp . The Crooked River Wetlands Volunteers for a project supporting accessibility. Watch the Cart Shed construction video. Friends of Ladd Marsh Wildlife Area (La Grande) for establishment of a Monitoring Avian Productivity and Survival (MAPS) station. Report about successful completion of first year of operation. Rogue Valley Audubon Society for placement of 4 Great Gray Owl nest platforms in the southern Cascades. 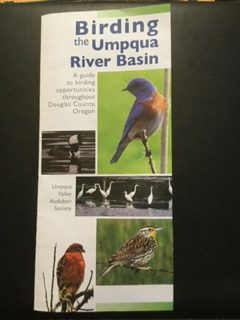 Umpqua Valley Audubon Society for printing an updated Birding Map of Douglas County.